Christmas is a peak period for bargains, but it is also a popular time for fake electrical products. Everyone wants to get the best price for a product, but there are dangers of buying cheap electrical goods online. Over one million people buy counterfeit electrical goods in the UK every year. From Christmas lights to electrical goods, there is a risk that they could be made from cheap and faulty parts and haven’t been tested to comply with the UK safety standards. Trading Standards have warned the public “if the price seems too good to be true, it normally is”. At Christmas, you don’t want to worry about fire risk while you string up your festive lights. 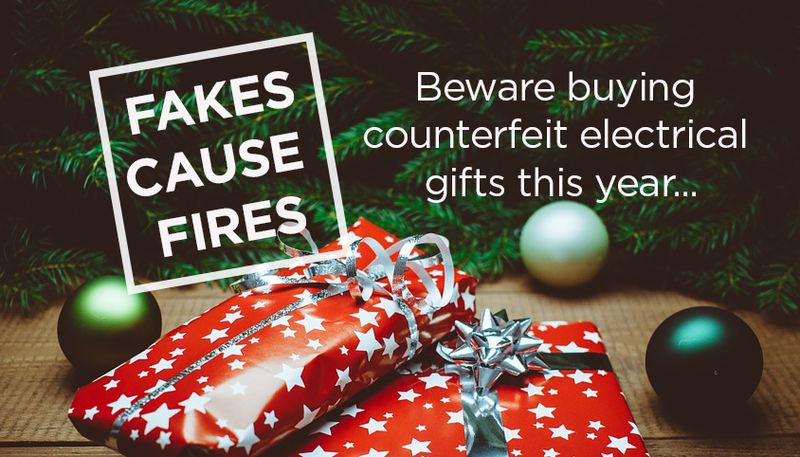 Follow a few checks to make sure you aren’t buying counterfeit goods this year and giving someone the worst present. You should always buy your electrical goods from a reputable shop, to ensure they are made with high quality parts. Buying from a social media advertisement online or buying second hand carries risks, from products which don’t work to ones which fall apart and put your life at risk. Checking for safety marks has become trickier in recent years, as fake products made in China have begun to reproduce the symbol on their products. London Fire Brigade has a guide which helps tell the difference between real and fake safety marks. Products which meet the UK safety standards and have been tested extensively, will display either the British Kitemark or CE Safety Standard symbols. It’s hard to resist a bargain, especially at Christmas, but the abnormally low price could mean it is actually a fake product. Shortcuts are taken with counterfeit goods, in order to keep the costs down in production, which means the product has a shorter lifespan compared to quality products. Make sure you don’t enter a false economy by buying a cheaper product that doesn’t last as long, which means you will have to buy again and spend more. It’s best to shop around for the best price for the product. Research the trader before buying, as they could be outside the UK. This means that the electrical item may not be tested to UK safety standards and also the plug may be a different connection to the UK standard. Which? found that 23% of fake goods were bought from Amazon and eBay so it is best practice to be aware of who the seller is, if they are located in the UK and what other reviews are like. If you aren’t sure about the product, it is best not to plug it in as you could be putting yourself and others at risk. If you enjoyed reading about counterfeit electrical goods, take a look at the new advancements in artificial intelligence technology!